A metabolism-boosting green smoothie that's totally Pinterest-worthy. It's a rare day when a pic of some sort of green drink doesn't show up in my Instagram feed”and for good reason. 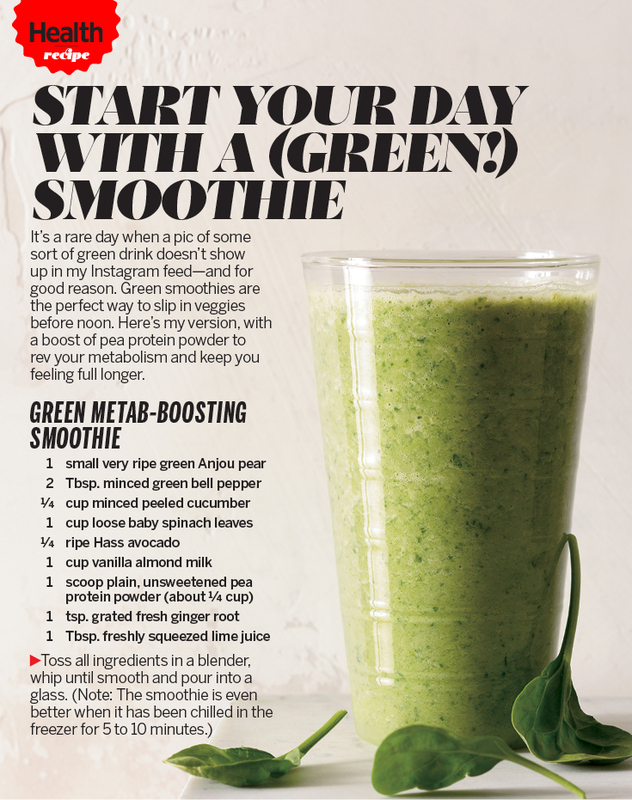 Green smoothies are the perfect way to slip in veggies before noon. Here's my version, with a boost of pea protein powder to rev your metabolism and keep you feeling full longer. Cynthia SassÂ is a nutritionist and registered dietitian with masterâ€™s degrees in both nutrition science and public health. Frequently seen onÂ national TV, sheâ€™s Healthâ€™s contributing nutrition editor, and privately counselsÂ clientsÂ in New York, Los Angeles, and long distance. Cynthia is currently the sports nutrition consultant to the New York Yankees, previously consulted for three other professional sports teams, and is board certified as a specialist in sports dietetics. Cynthia is a three-time New York Times best-selling author, and her brand new book is Slim Down Now: Shed Pounds and Inches with Real Food, Real Fast. Connect with her onÂ Facebook,Â TwitterÂ andÂ Pinterest.